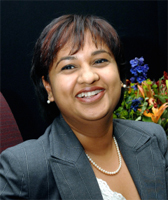 Kammy Naidoo is a customer advocate at heart and ethics is core to her work under the banner of treating customers fairly. She has a B.Com. in Business Administration and Legal Studies (University of Natal) as well as a MBA from the Gordon Institute of Business Science. She has over 15 years’ experience in the financial sector, the majority in senior management. In 2011 she left the financial sector to provide services within the consulting field. In addition to consulting to the financial sector on issues relating to developing good, ethical business habits, market conduct and customer experience, she facilitates strategic planning sessions for a range of clients. Her primary focus currently is on successfully integrating regulatory requirements with customer experience benefits and ultimately meeting business needs.